In reading Pearce (2010), I found myself asking Is my research selfish? but soon realized that the question really should be In what way is my research selfish? I would question anyone who is doing research that report to do so for only altruistic or objective reasons. I believe that everyone does research for selfish reasons – it is our personal desire to gain knowledge, to learn, that drives us to do research. And so, all research is inherently selfish in some way. In what way is my research selfish? Through my research I am seeking a validation for the work I have done over the last 18 months – since my cancer diagnosis. 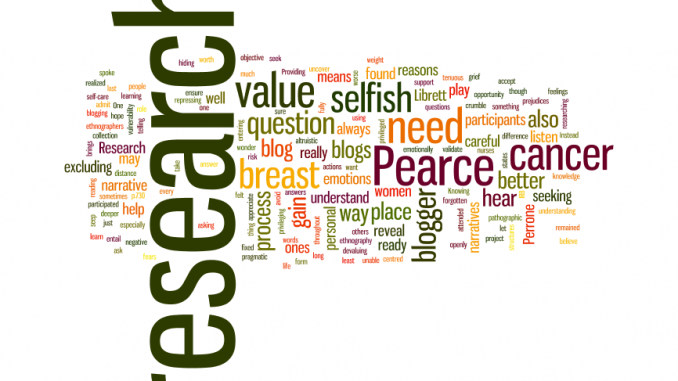 I seek to understand better the impacts breast cancer blogs have on those who read them. In doing so, I am validating my personal worth as a breast cancer blogger. “I was unable to listen clearly to the women who participated in the study because I was always centred. I could not hear their narratives because I remained fixed on though about my own experiences” (Pearce, 2010). Further to this, I will need to be careful to not just hear the positive stories, but also to hear the negative ones. I also need to be careful to avoid privileging one narrative, specifically the narrative of the blogger, and especially the blogger who is seeking a means to justify her actions as a blogger. “Providing space in order for the participants to be heard did not have to entail devaluing or repressing my own responses. Instead I had to accept my emotions, prejudices, and memories will always be present, much like my grief, and seep into the narratives I listen to.” (Pearce, 2010). To help put a distance between myself and those participating in the research, I wonder if I should be excluding my own blog as a means of recruitment? My blog will play a very important role in the writing of an auto ethnographic (pathographic) account of my research findings. My blog will necessarily have a privileged place in my research. Should I be using it, or should I be excluding it, in the data collection process? As a pragmatic researcher, I also have to ask the question What is the value in my research? I appreciate fully that value is a subjective thing. What is of value to me personally may very well not be of value to others. However, I do feel there is value in better understanding what people are learning from breast cancer blogs. Understanding this can help physicians, nurses, patients, and loved ones better understand the place that breast cancer blogs can play. At least, that is what I am telling myself. That is the value that I am hoping to validate through my research. “I felt scared as if the words the women spoke would reveal something I was hiding from. Or worse they would reveal nothing, they would not provide any answers” (Pearce, 2010). The other question that I need to answer is Am I ready to do this research? Am I emotionally ready to take a deeper dive into breast cancer blogging? Knowing that the research process will likely uncover emotions that I have long forgotten. The research may very well unearth feelings and fears that I have been suppressing. Pearce (2010) states “The only opportunity I found to really let my vulnerability be visible was in the counseling sessions I attended once a week”. This brings up my own need for some form of self-care throughout the research process. I will need to be sure that my research is not harming my sometimes tenuous mental health. I will need to make use of the support structures I currently have in place, to ensure that I do not crumble under the weight of my own research. Congratulations Rebecca on this post. It has ‘value’ not only for your research plans and appropriate ‘note to self’ re self care, but will also have generic value for others who seek to create their own projects that ethically embrace the experience of investigating topics that are not externalised in an artificial separation/binary of objective-untouched-researcher vs research-population. As your study progresses and the points from this post are revisited you will likely have the material for an interesting research ethics/methodology article at some point.